Richard O’Donnell is rooting for Rotherham United to win promotion this season - but only after the Cobblers take three points from them this weekend. The Town goalkeeper started this season at the Millers, playing 10 times in Sky Bet League One, before his January transfer window switch to the Cobblers. In all, O’Donnell played 27 times for Rotherham in his 12 months at the New York Stadium and has a soft spot for his former club, but he is determined to play his part in putting one over them this weekend. The Millers have had a bad week, losing to Rochdale on Saturday and MK Dons on Tuesday, but prior to that they had put together a 14-match unbeaten run under manager Paul Warne, winning 11 of those, to storm into the promotion play-off places. Indeed, they were threatening to challenge the top two until this week’s double slip, but O’Donnell admits he wasn’t surprised by that impressive run and charge for promotion. “Their form hasn’t surprised me at all, as the squad they have got there is really good and is full of very talented players,” said O’Donnell, who was a regular in the Rotherham team until November, when Marek Rodak made the keeper’s shirt his own. “They have a good manager, good coaching staff, and it is a very good, well-run club, so it doesn’t surprise me where they are at all. “I have nothing but respect for everyone there, but obviously all I want going into Saturday is three points, and then looking further ahead I would love Rotherham to go up as I have a lot of good friends there. 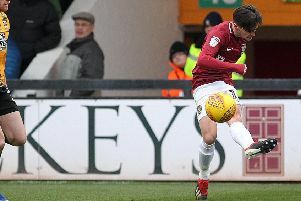 O’Donnell obviously knows the Rotherham squad well, and although the team lost top scorer Kieffer Moore at he turn of the year, they have continued to impress, with former Cobblers loan striker Michael Smith impressing. But he is not the only danger to Town, with O’Donnell saying; “There are a lot of threats, and attacking-wise they are very good, and recently they have been very good defensively as well. So is O’Donnell expecting Town boss Jimmy Floyd Hasselbaink to ask for any inside knowledge on the weekend opposition? “I will give the manager all the information I can give him, but at the end of the day we have to just concentrate on ourselves,” said the 29-year-old. As a goalkeeper, O’Donnell is also going to get pretty close to what is set to be a sizeable away following at Sixfields on Saturday. The shot-stopper is hopeful he will get a good reception from the Millers fans, as he had a good relationship with them before his departure to Sixfields, but he admits that even if he doesn’t, he will be prepared for it. Asked if it is strange to run out in front of a former club’s fans, O’Donnell said: “I have done it a few times before, but it has obviously been quite a quick turnaround since I left Rotherham. “But it won’t be strange. “I know the job in hand and I know I have to keep my head on the game and not concentrate too much on any set of supporters, whether they are from my old club or any other. “I went to Bristol Rovers on Saturday and they obviously gave me a bit because I played for Bristol City, and I quite enjoy it to be fair! “I like all of that, but I think it will be a bit different this weekend .